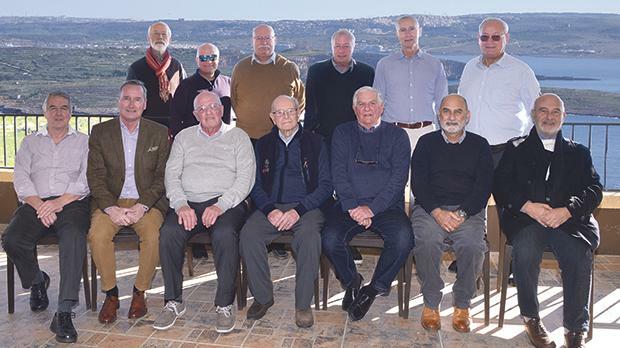 A surprise get-together over lunch was held on January 7 at Xerri il-Bukkett in Gozo to celebrate the 90th birthday of Geoff Fosberry. This was attended by a number of friends who travelled from Malta for the occasion. Seen here (standing, from left) are The Reverend Colin Westmarland, David Jaccarini, Alan Miller, Paul Warren, Lawrence Porter and Charles Cilia with (seated, from left) Tim Edmonds, Simon Walker, Jack Ibbotson, Geoff Fosberry, Jeff Poulton, Anton Valentino and Roger Baldacchino.